More than 100 aquatic or marine mammal species rely on freshwater or the ocean to live, feed and reproduce. Some of these include seals, whales, dolphins, manatees, and otters. The people responsible for studying these animals, their behavior and their habitats are called marine mammalogists. Marine mammalogists are specialized marine biologists who study marine mammals such as whales, dolphins, seals and sea lions. The responsibilities of a marine mammalogist can vary widely and may include duties related to research, education, rehabilitation, training and more. Research-related positions are perhaps the most common for those involved in marine mammalogy. The duties of a researcher include designing studies, writing grant proposals, collecting and analyzing data, supervising research assistants, and publishing study findings for peer review in professional journals. Marine mammalogists routinely work in the field, conducting studies in the ocean, marshes and wetlands. They may rely on equipment such as scuba gear, boats, traps, nets, sonar devices, video equipment, robotic instruments, computers and traditional laboratory analytical devices. Marine mammalogists often work long hours, and they may be required to work evenings, weekends and holidays. They are frequently exposed to changing temperatures and weather conditions while conducting research in the field. But try not to use what you see and hear on TV or in films as a guide. The days of a marine mammalogist are often long and tedious. Many marine mammalogists spend a lot of time at sea, in labs or on computers. Other work can by physically taxing, with lots of heavy lifting and cleanup. Marine mammalogists can choose to specialize on one specific group of animals: pinnipeds (seals, sea lions, and walrus), cetaceans (whales, dolphins, and porpoises), manatees and other aquatic mammals (sea otters and polar bears). Some specialize even further, studying one aspect of one specific species such as the behavioral interactions of seals. Potential employers for marine mammalogists can include aquariums and zoological parks, governmental agencies (on the federal, state, and local levels), laboratories, museums, educational institutions, conservation groups, and military organizations. 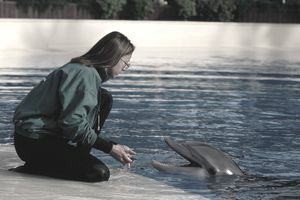 Other careers related to mammalogists include marine veterinarians and marine trainers. These two fields also have their own separate set of educational requirements, certifications and professional groups. An undergraduate degree is considered to be the minimum level of education required for entry-level work in the field of marine mammalogy, with a Masters or Ph.D. being necessary for research work and other upper-level roles. Most marine mammalogists pursue a degree in marine biology, zoology, animal behavior or a closely related area. There are a few collegiate programs that offer coursework specifically in marine mammalogy — specifically, the University of Hawaii’s Marine Mammal Research Program. Regardless of the degree, an aspiring marine mammalogist pursues, a strong foundation of coursework in areas such as biology, chemistry, physics, computer science, and statistical analysis are important. Laboratory skills are also highly valued, as marine mammalogists frequently conduct scientific studies that require analysis. It is always important for a candidate to have extensive practical experience in the field, which can often be gained through college internships. Many marine animal internship options provide hands-on training and allow students to network with established professionals in their area of interest. Marine mammalogists may also consider pursuing scuba certification and developing strong swimming skills in order to conduct field research in direct contact with their animal subjects. Boating skills may also be utilized during a marine mammalogist’s career. The Society for Marine Mammalogy is a professional membership group that hosts conferences, publishes a peer-reviewed journal and facilitates networking through an online membership directory as well as a job search site. The society also offers a series of useful links for NGOs and non-profits, other groups, marine graduate programs and educational facilities and museums across the globe. The group currently has more than 2,000 members in more than 56 different countries. According to the organization's website, its members range from students who are beginning their course of study to global experts in the field. The U.S. Bureau of Labor Statistics (BLS) does not separate the salaries of marine mammalogists from data it collects for the more general category of zoologists and wildlife biologists. The median annual wage in 2017 was $62,290 per year ($29.95 per hour) for the category of all zoologists and wildlife biologists. The lowest paid 10% of zoologists and biological scientists earned less than $39,620 while the highest paid ten percent of zoologists and biological scientists earned more than $99,700 per year. The salary individual marine mammalogists earn can vary widely depending on factors such as their level of education, their level of practical experience, the geographic area where the job is located, their area of specialization and the specific duties that their role entails. According to the National Oceanic and Atmospheric Administration (NOAA), there really is no set data on students who go on to become marine mammalogists. But in 1990, the National Science Board reported that 75% who completed undergraduate studies were employed. The BLS reports jobs for zoologists and wildlife biologists — which includes marine mammalogists and other marine scientists — will grow at a rate of approximately 8% over the decade from 2016 to 2026. This represents a slower rate of growth than the average for all professions. Demand for more people in these fields will grow in order to study the increasing interactions between humans and animals in their natural habitats. But growth will likely be limited because of the funding and budgetary restrictions set forth by various levels of government. The field of marine mammalogy is particularly competitive to enter as there are many more interested job seekers than positions available. Candidates with extensive practical experience and a high level of education will have the best job prospects in this popular field.